The large Schyven / Van Bever organ of the Notre-Dame in Laeken (Brussels, Belgium) showcasts the height of romantic organ building in Belgium. 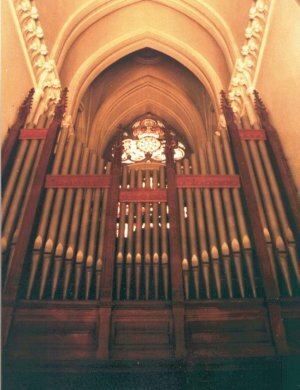 Having worked together with Cavaillé-Coll, Pierre Schyven developed his own unique style of organ building. His organs show many similarities with the organs of the grand french master, but still display their own tonal character. Powerful reeds, beautiful solo flutes and a strong, but not piercing Tutti, mark the sound of this beautiful instrument. We are proud to be able to present this beautiful and powerful sound to the Hauptwerk community. This sample set is available only for Hauptwerk 2 and above. 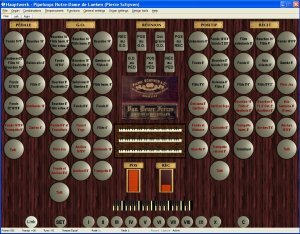 It features around sixty combinations of this famous organ. 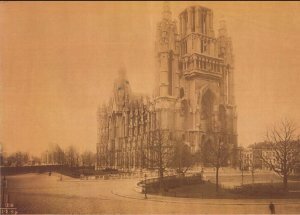 The sample set features three release sample layers (the original recorded release plus two layers created artificially for staccato and portato notes) resulting in a superb rendering of the cathedral accoustics. The impulse responses used for the additional layers are included as a special bonus. Note: The samples and ODF are not encrypted. Hence the samples may also be used with other sampler software and no Hauptwerk dongle is required. A free trial version of this sample set is now available. Please look at the 'Trial-Version' tab for details. The sample set features around 60 combinations on three manuals plus pedal, the usual couplers, plus ten general pistons to facilitate registration. In addition to the full recorded release samples, two additional release layers have been created using convolution reverb. We have pioneered this technique in our Madeleine sample set with great success, and also in this sample set the result is remarkable. All stops/combinations have been recorded with two Neumann microphones directly to digital tape, at 16bit 44100Hz. There are four samples/octave for most combinations, the celeste stops have been sampled note by note. The Voix humaine on the Récit has been sampled with tremulant "on", since it is mostly used this way and to give the most realistic tremulant sound possible. Hence the Voix humaine stop is not affected by the Récit tremulant, which is implemented using HW's wave form technique. However, the tremulant frequencies are matched carefully and the sound of the sampled trem together with e.g. the Gambe using the waveform trem is just great, as you can hear yourself by listening to the Andante by Lefébure Wely. 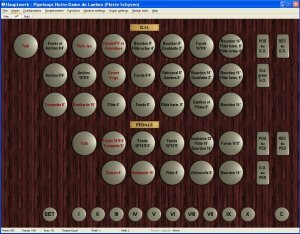 The sample set includes two organ definition files, one labeled “lowmem” for users with limited available memory, and the regular version. We have decided to give users the most flexibility and so both versions share the same full set of combinations. Some combinations (marked in blue in the list below) are redundant, since they can be completely built up from other solutions in the set, and so may be omitted from loading to save memory. In addition the lowmem version uses only two release layers (original recorded plus one staccato layer), the release tails have been slightly shortened and the set only uses the original manual compass up to g’’’. The full set in contrast uses three release layers and a manual compass up to c’’’’, naturally no shortening of release tails has been applied here. Please have a look at the requirements page to see how much memory is needed to load the set. Both versions share the same config files, so that voicing changes and combination files always apply to both organs. In the followong the combinations available in the set are listed. This sample set is designed to be used with Hauptwerk™ version 2 and above and will not work with other sound producing software. It requires a modern PC with at least 4GB available memory and an operating system supporting Hauptwerk and large sample sets, currently ideally Windows X64. There are separate definition files for people using monitors with 1024x768 and 1280x1024 pixel resolution. 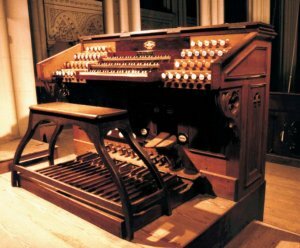 Obviously the higher resolution looks better, the smaller resolution version also does not display the manuals and pedal (these would have been too small to be useful), but it allows people with 15” touch screens to use the organ. There are numerous loading options in Hauptwerk, and so in general it is difficult to state memory requirements for a large sample set. We have tried to estimate the per rank memory requirement for three different load settings (loading 20 ranks and taking the average), and summarized the results in the table below. This can give you a feel how many ranks you can squeeze into your available memory when using certain options. The first column in the table is the base memory required by Hauptwerk with the ODF loaded (showing the rank selection screen). At this time the internal data structures have already been loaded. The other columns show the additional memory requirement per rank when selecting certain options. Note that you can mix different columns (load some ranks in 14bit and others in 16bit), but you cannot mix rows (=ODF versions). Organist: Anton Doornhein from the Netherlands. Many thanks to Anton for these recordings! All pieces have been played live and recorded directly from Hauptwerk without any additional sound processing. 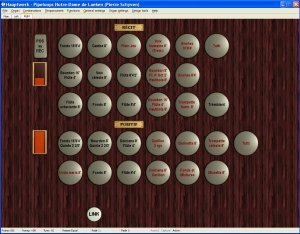 This is the trial version of the sample set of the Schyven / Van Bever organ in Notre Dame de Laeken (Belgium). Please look at the description of the full version for details and sound demos of this sample set. The organ definition files as well as the samples are encrypted, hence the trial version will only work with a registered Hauptwerk installation (with dongle). Only the 15" gui screens are included. These do not display keyboards and the images are not as clear as for the large screen, but we could not include all ODFs for filesize reasons. The download consists of two large files (approx. 2.2GB), so expect rather long download times. You will need to download both files and install them using Hauptwerk's built-in component installer.